After nine years of this raging bull market in stocks, this is the most important question for investors now: Bulls or bears — who is right? Let’s start with a chart. • The rally failed at the resistance level. • The market is now around the trend line. • If the trend line decisively breaks, the next two support levels are shown on the chart. • Previously the relative strength index (RSI) traced higher lows. But now RSI has traced a lower low. 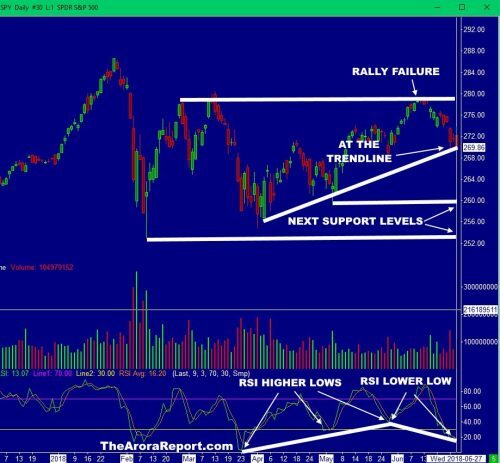 The only reasonable conclusion that can be drawn from the traditional technical analysis is that the market has lost its momentum, but is still not in the imminent danger of a bear market. There are several special factors coming into play. • Window dressing is in play. Some money managers buy winning stocks at this time so they can show in their reports that they were holding winning stocks. • Some money managers may rebalance at this time and take profits. • New money flows into the market during the first couple of days of a new quarter. • There is a holiday (July 4) in the middle of the week. This will reduce liquidity and increase volatility. • The jobs report is due next Friday (July 6). Often the market makes a big move ahead of the jobs report based on rumors and estimates….Read more at MarketWatch.